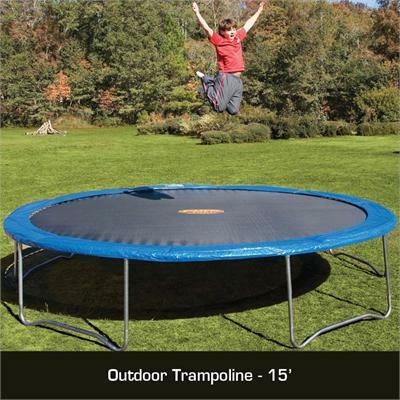 Don't sit inside this summer, jump on your very own 15 ft Pure Fun trampoline. Why sit in front of the tv all summer when you can be staying fit and having a great time seeing just how high you and your friends can jump? Jumping is proven to improve motor skills which makes it perfect for athletes that need to stay ready for sports as well as working out the important muscles needed to stay healthy. Pure Fun™ Trampolines are made with strong, rust-resistant galvanized iron steel tubing using patented T-Section construction. This is safer and longer-lasting than conventional welded trampolines. The secure fit of T-Section assembly insures extra stability. It also prevents shifting over time, which adds to the longevity and safety of the trampoline and gives parents peace of mind. This trampoline has W-shaped legs with 8 balanced contact points for increased stability to prevent wobbling or tipping. High-performance steel springs supply a deeper, more exhilirating bounce. A weather-resistant mat, PVC frame cover and thick foam rail padding over the springs add extra protection. This trampoline is easy to assemble and includes a patented assembly tool - no other tools are needed! 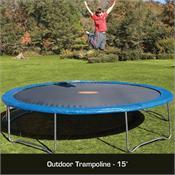 This trampoline meets or exceeds the ASTM requirements.